We’re partnering with Nancy Shore and getDowntown to get you all geared up for winter bike commuting. The workshops are this week Wednesday (5:30-6:30pm) and Thursday (12-1pm) at 301 E. Liberty. Registration for the workshops is now closed, but getDowntown has a lot of great winter commuting (bike and other) resources you can find in their Conquering the Cold section. 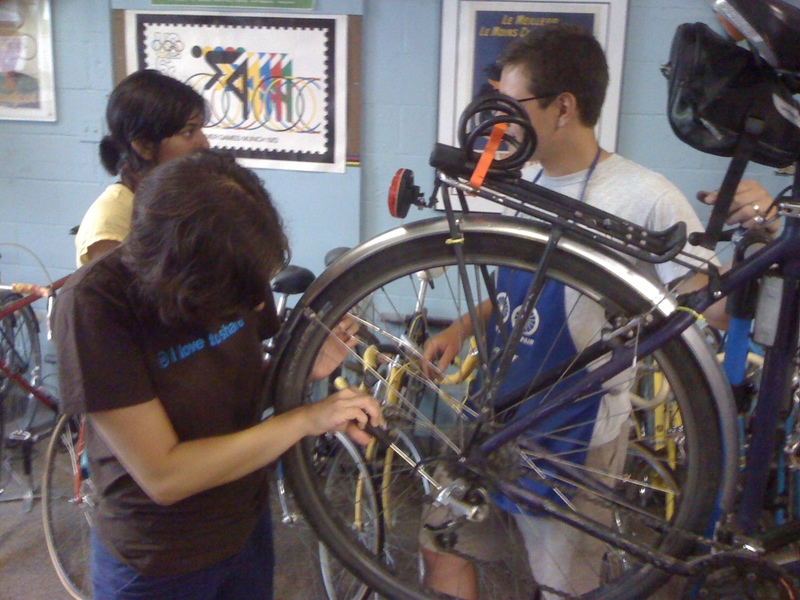 With our course at Outdoor Adventures and the Mobile Repair Stand packed away until next spring, we’ll be running open workshops at Outdoor Adventures (336 Hill St) on Wednesday nights from 7-9:30 p.m. It runs the same way as in Kerrytown: stop by if you need help, stop by if you want to help. The first one starts tomorrow, November 2nd. As always, feel free to join the google group for more info about these workshops and other volunteering opportunities. 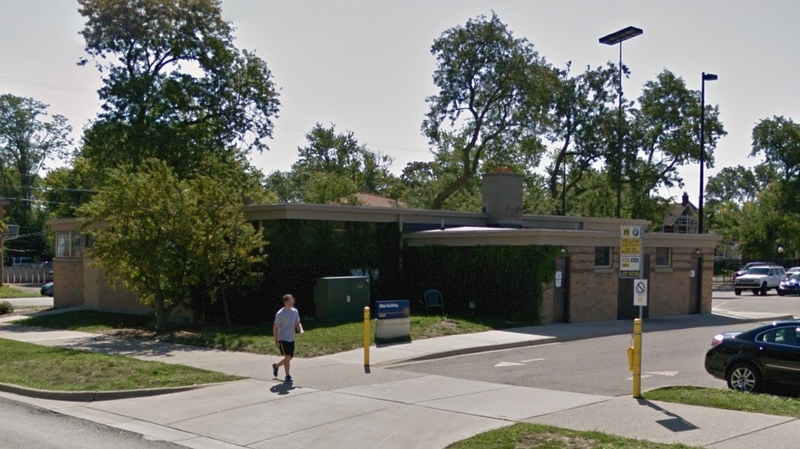 There is a fee: $5 per class, or $20 for the whole shebang, but that money will go towards snacks and beverages for an optional post-or-mid-series bike ride (or other activity, depending on weather and folks’ preferences). Whether you’ve been working on bikes for a while and want to freshen up, or if you’re just starting to get your hands greasy, or if you think (rightly so) that Eric, Sam, Sandy, Ben, and Molly are super cool and you want to learn everything they know…come on out! 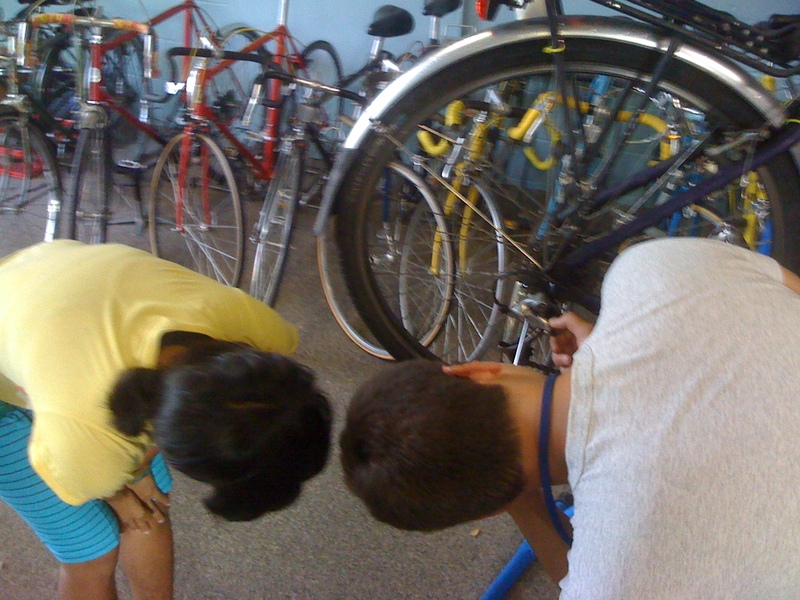 Our first bike repair workshop was great! 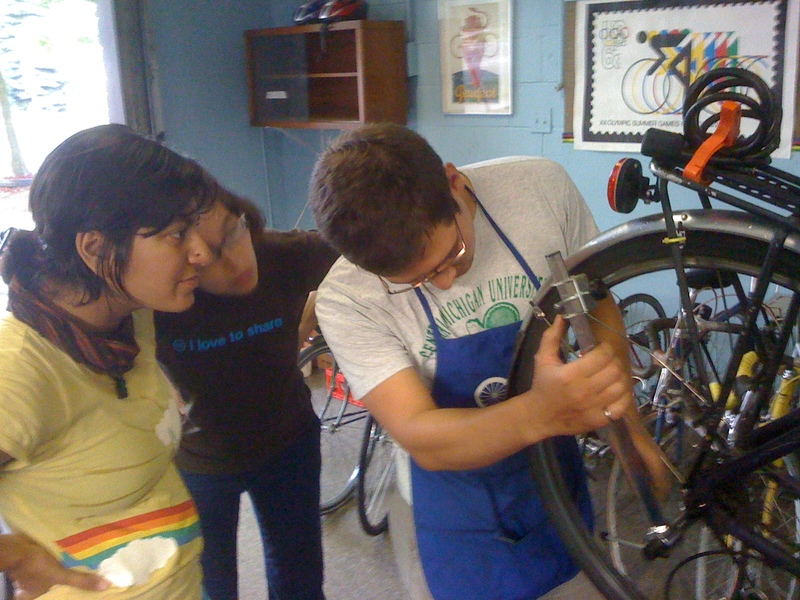 Last week Common Cycle pulled together our first bike repair workshop. 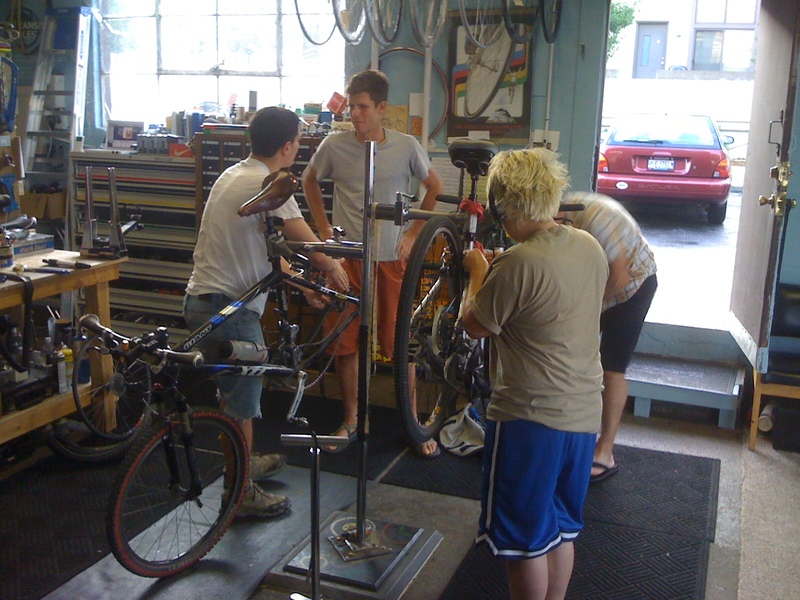 Many thanks to Sic Transit Cycles for letting us use their space for this event. While we march forward on the path to finding a shop of our own help like this is invaluable. You may not have heard about this workshop in advance: It came together in a hurry and was a test of sorts for us. Thankfully the workshop was a great success and we plan to have more in the future. Next time we’ll get the word out and you can participate. All told we had about a dozen people and four stands with bikes. Our design was to have the group decide what they wanted to learn. There was an instant consensus: Derailluers! I learned about derailleurs with Molly and Anika from Eric. We put my bike up on the stand it is as shifty as ever now. 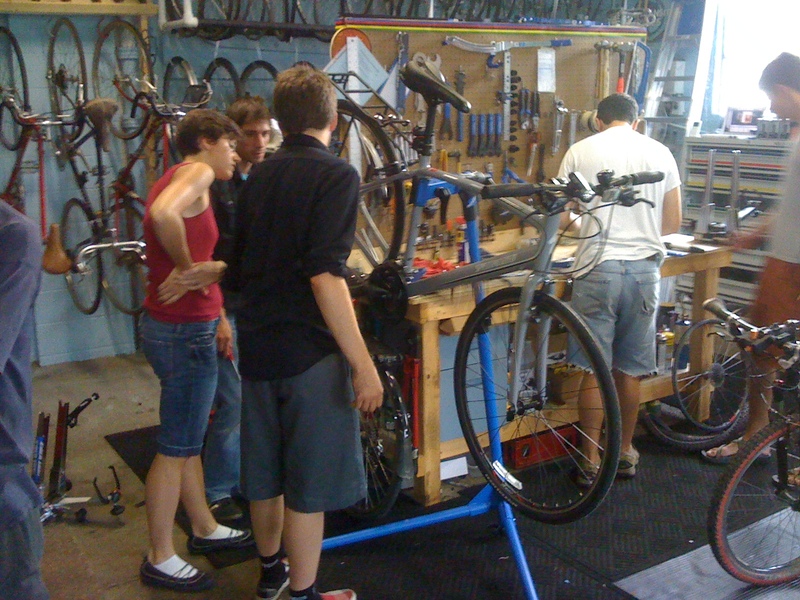 One nagging problem I’d had in the middle of my cassette was massaged away by our combined tinkering. In addition to the help from Sic Transit, a special thanks to Commoners Steve Cain, Sam McDermott, Jimmy Ragget, and Eric Jankowski for teaching the rest of us about how our shifty bits work, and how to adjust them.